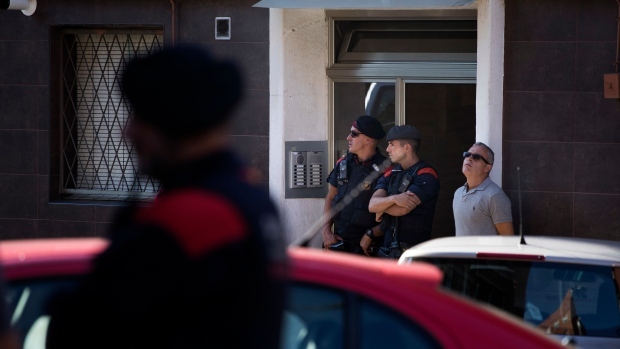 BARCELONA, Spain -- A man pleaded to be let into a locked police station in Barcelona before dawn Monday, then lunged with a knife at officers inside. Police shot him dead and the attack is being investigated for any links to terror, authorities said. Despite the police suspicions, the Interior Ministry said it was keeping the country's terror alert at level 4, indicating high risk. Spain has been at that stage of alert since 2015, following a series of terror attacks abroad. Level 5, indicating a "very high risk" of attacks, is the highest level. Police said that as a precaution they evacuated the apartment block where the suspect lived, about 200 metres (yards) from the police station, before bomb disposal experts, forensic teams and sniffer dogs began a search of the premises.